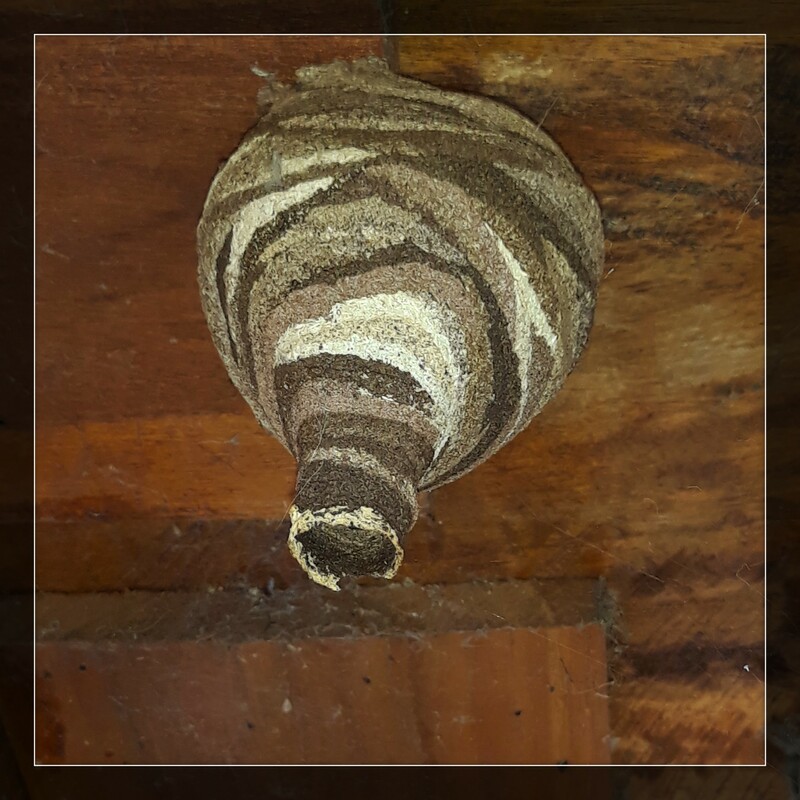 The Wasps have started work on a new home in the porch of our home. I am tolerant, but the rest of my family is not impressed. These are truly works of art!! Ray: Quite spectacular, isn't it. Will they move out eventually?? Ray: I expect they will leave at some point, Astrid, like most guests. Ray: C'est certainement l'un des plus beaux nids que j'ai vus, Martine. Now you have me wondering if wasps are "beneficial" to have around, Ray??? If not, I have sympathy for the family's sentiment. Ray: Wasps are beneficial, Ginnie...they clear some caterpillars out of the pot plants. Ray: I am allergic also, Lisl, but have confidence they will leave me alone as I am not a threat to their nest. How vicious are Thai wasps? Ray: There are many wasps species in Thailand, Chris, and their temperament covers the whole spectrum. These ones are not a problem unless they suspect their nest is under threat...then they become horrifically aggressive. Ray: Le nid est une belle chose, Claudine, et je ne suis pas enclin à jeter l'Artiste! You can buy spray that will kill the whole nest Ray. I have to say that the nest is a work of art. Well it’s not in actual fact but you know what I mean I’m sure. Ray: I think I will leave 'em there for a while, Chad. Ray: Cripes, Bill...what about the artistry of this Wasp! Oh, the wasps love your home, and I understand why they do. Ray: And, I love their beautiful nest, Philine. That bottom picture shows a nest extraordinaire - a real work of art. Ray: It is a beautiful thing, Louis, and made me wonder if our ancestors got their idea for an earthenware water-carrying pot from studying this nest. As attractive as the structure is I would not be able to cope with the wasps. The sole purpose of a wasp is to bring misery and mayhem into my life. Ray: I am allergic to the stings of the wasp, Alan, but cannot turn away a guest who is so obviously an Artist of great skill. It is an amazing construction but if this was in my house I would have to move out untill the Wasp season is over however long that is. Ray: They pay their way with lovely artworks, Brian. I can tell you how to prevent them though I don't know how well it will work now that they are started. We now buy wire framed paper wasp nests at the dollar store but before that, you blew up a paper bag and hung it anywhere the wasps usually put their own nest. I see yours are beautifully coloured and of a smaller variety but some variation of the theme may work. Ray: To be honest, Mary, I am not sure I want to prevent them from being guests...they make the most beautiful nests. I can understand how the inflated paper bag would work. Well I guess they won't bother you if you don't bother them That bottom nest is a work of art! Ray: It is a made object of surpassing beauty, Tom. Ray: They are fabulous constructions, Larry.